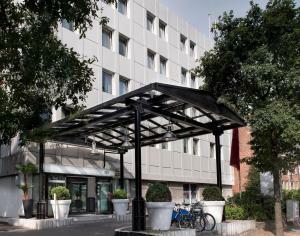 This hotel in Hamburg’s Stellingen district offers spacious rooms with free Wi-Fi. The Imtec and O2 Arenas are 4 km from the hotel and the A7 motorway is under a 1 km drive away. All rooms at the TRYP by Wyndham Hamburg Arena feature floor-to-ceiling windows. A flat-screen TV with free Sky channels, minibar and hairdryer are provided. Free tea and coffee is provided. A varied breakfast buffet is prepared at the TRYP by Wyndham Hamburg Arena. The Galerie restaurant serves German and international food, and has a children's menu. Guests can also relax in the stylish Bar 333, which also has Sky sport channels. Langenfelde S-Bahn Train Station is 800 metres from the TRYP by Wyndham Hamburg Arena. It offers direct links to the port and city centre. There is also a bus stop 100 metres away, connecting you to the Neue Flora musical theatre.